Take the A, C, E, B, D, F to West 4th St. Or take the 1 to Sheridan Sq./ Christopher St.
Head north on Federspiel St toward Main Street. Turn left at Main Street. Turn right at Martha Washington Way. Take the I-95 N ramp. Turn right at I-95 N. Take exit 1 for RT-9A S/H Hudson Pkwy S. Merge onto RT-9A S. Turn left at Clarkson Street. Continue on Carmine Street. Turn right at Bleecker Street. Sharp left at 6th Ave/Ave of the Americas. Turn right at W 4th Street. Turn right at MacDougal Street. Turn right at Minetta Lane. Head northeast on Triborough Bridge. Take the exit toward Downing Stadium/Randalls-Wards Is/Manhattan. Merge onto Triborough Bridge. Take the ramp onto FDR Dr S. Take exit 7 toward E 23 Street. Merge onto FDR Drive. Turn right at E 23rd Street. Turn left at 2nd Ave. Turn right at E 3rd Street. Continue on Great Jones Street. Continue on W 3rd Street. Turn left at MacDougal Street. Turn right at Minetta Lane. Head southeast on RT-495 E. Turn left at W 36th Street. Turn right at 7th Avenue. Turn left at W 4th Street. Slight left at Sheridan Square. Continue on W 4th Street. Turn right at MacDougal Street. Turn right at Minetta Lane. Head east on Holland Tunnel, entering New York. Take exit 3 toward Brooklyn. Merge onto Beach St/Ericsson Street. Continue to follow Beach Street.Beach St turns left and becomes W Broadway Continue on LaGuardia Place. Turn left at W 3rd Street. Turn left at MacDougal Street. Turn right at Minetta Lane. Head east on Williamsburg Bridge. Take the ramp onto Brooklyn Queens Expy/I-278 E. Take exit 35 to merge onto I-495 W toward Midtown Tunnel. Take the exit toward Queens Midtown Tunnel exit/Tunnel exit Street. Keep left at the fork, follow signs for 34 St/Downtown/35 St and merge onto Queens Midtown Tunnel exit/Tunnel exit Street. Turn left at E 34th Street. Turn right at 2nd Avenue. Turn right at E 3rd Street. Continue on Great Jones Street. Continue on W 3rd Street. Turn left at MacDougal Street. Turn right at Minetta Lane. Head southeast on Manhattan Bridge. Turn right at Concord Street. Turn left at Jay Street. Turn left at Tillary Street. Turn left at Flatbush Ave Ext. Slight left at Manhattan Bridge (signs for Canal St W/Manhattan Bridge Lower Rdwy). Slight right at Canal Street. Turn right at Bowery. Turn left at Great Jones Street. Continue on W 3rd Street. Turn left at MacDougal Street, 190 ft. Turn right at Minetta Lane. Head southeast on Brooklyn Bridge. Turn left at Tillary Street. Turn left at Flatbush Ave Ext. Slight left at Manhattan Bridge (signs for Canal St W/Manhattan Bridge Lower Rdwy). Slight right at Canal Street. Turn right at Bowery. Turn left at Great Jones Street. Continue on W 3rd Street. Turn left at MacDougal Street. Turn right at Minetta Lane. Head north on Brooklyn Battery Tunnel. Take the RT-9A N/West St exit. Turn right at West St/West Side Hwy. Turn right at Watts Street. Slight right at Canal Street. Turn left at Hudson Street. Turn right at King Street. Turn left at 6th Ave/Ave of the Americas. Turn right at W 4th Street. Turn right at MacDougal Street. 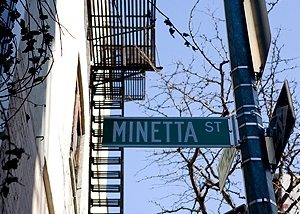 Turn right at Minetta Lane.